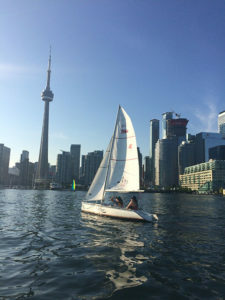 The Martin 16 is a Canadian designed and built keelboat, though some would say disguised as a dinghy. It is nimble, fun in a breeze but with a 330lb keel it is impossible to capsize! The cockpit layout is designed to cater to those with limited mobility; the helmsmen sits steers with a central “joystick” style tiller and both main and jib sheets are led through a central easy-to-reach pulley. All other adjustments, such as the boom vang, cunningham, outhaul, and bilge are within arm’s reach. The sailor sits low in the boat in an adjustable seat that can accommodate any special postural needs. If necessary, quick-release straps can be used to stabilize the sailor’s trunk when the boat heels (leans to the side) on windy days. A ‘rumble’ seat behind accommodates an instructor or campanion sailor. The 23′ Sonar one-design keelboat is a high-performance racer and also a comfortable day sailor. It is designed for accessibility since it has a spacious cockpit, sit-in safety and is inherently stable. It was designed by Bruce Kirby and almost 700 boats have been built since 1980. 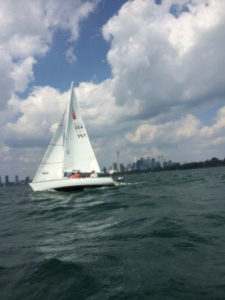 The Sonar is an International Class and was the 3 person Paralympic sailboat.